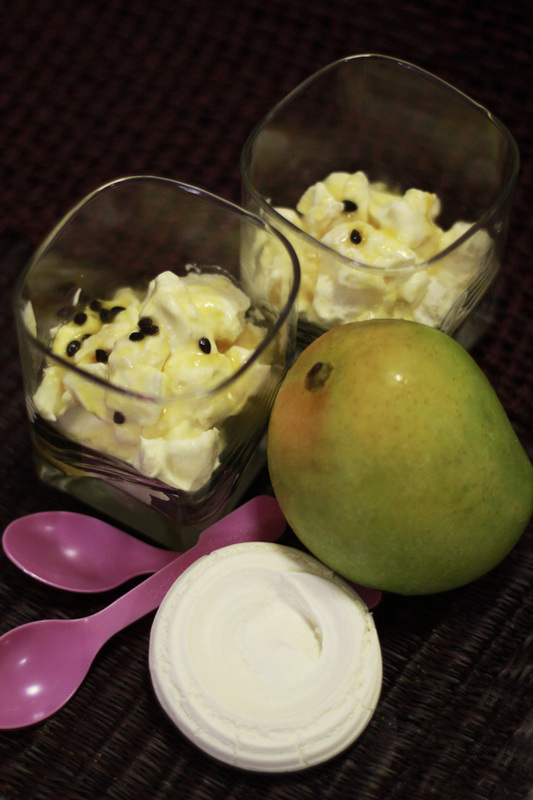 As I promised yesterday that I will post about Billy's Mango & Passionfruit Eton Mess! Here it is! 1. Cut the mango in half, discard the stone. Carefully cut a cross-hatch pattern through the mango down to the skin, being careful not to cut through the skin. Invert the skin, then cut all the mango cubes out. 2. Whisk the heavy cream and sugar together until stiff peak. 3. Break the meringue cups into big chunks and fold into the whipped cream. Add half mango cubes and fold it in. 4. Place a few spoonfuls of the mess on the plate, top with few extra mango cubes, then drizzle with passion fruit puree. Serve with a scoop of vanilla ice cream. I am totally in love with this easy to make recipe! It's great when you have guests around and you just want to make something delicious, quick and refreshing! It's awesome! Being the awesome me, I added durian (without the seed) into the dessert! 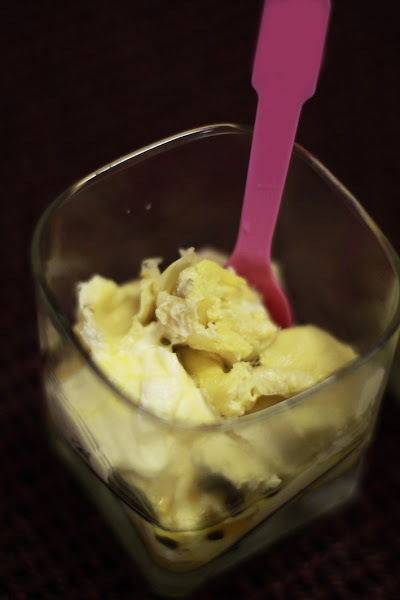 Tear the durian flesh into small chunks and mix it in! Just thought of letting you know, I'm a durian fan. I will always have a packet of durian stored in the freezer just in case I'm craving for it. I think this is absolutely the best time to use my durian! Make sure you try them!